In the inaugural edition it was written that “statistical analysis is coming to hockey in a wave very similar to the one that hit baseball years ago,” and guess what? That wave is here! With every passing season, there's another explosion of new analysts, new websites, new perspectives, and new developments. Non-traditional statistics are being used in TV and radio broadcasts, front offices are hiring statistical analysts, and newspapers and magazines are including whole new sets of data. It used to be that front offices, agencies, and media outlets would use analytics to get an edge, but now it's being used to avoid falling behind. Soon, venturing forward without an analytics team will be like venturing forward without trainers, or equipment managers. While we fans can certainly continue to enjoy the sport without analytics (and equipment managers), knowledge of the underlying numbers can help stretch that enjoyment. Acting as an invaluable supplement to traditional analysis, modern statistics can be used to test the validity of the conventional wisdom, and to gain insight into what teams are doing behind the scenes --- or maybe what they should be doing! Inspired by Bill James' Baseball Abstract, Hockey Abstract is not an annual guide to read once and place on a shelf, but a timeless reference of the mainstream applications and limitations of hockey analytics. More than just an update, this 2014 edition is 40% bigger and better, and includes heavyweight co-authors Tom Awad and Iain Fyffe. The Hall of Fame, what makes good players good, team-level player usage chart interpretations, shot quality, score effects, the value of enforcers, a deep look at goaltending, and a hunt for the game's best at scoring goals, drawing penalties, killing penalties and working the power play are all among this year's topics. Whether you use Hockey Abstract as a primer for today's new statistics, as a reference for leading edge research and hard-to-find statistical data, or whether you read it for its passionate and engaging story-telling, Hockey Abstract 2014 belongs on every serious hockey fan's bookshelf. 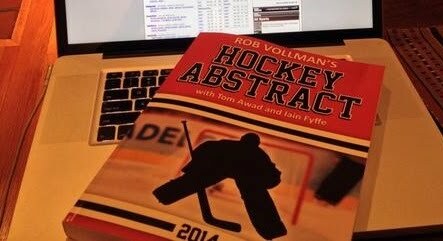 To arrange an interview with any of the authors, or to ask questions about the book, contact via email, vollman at hockey abstract dot com. Audio interviews are available on this site under the Listen link on the left hand side menu. Buy Rob Vollman's Hockey Abstract 2014 today!